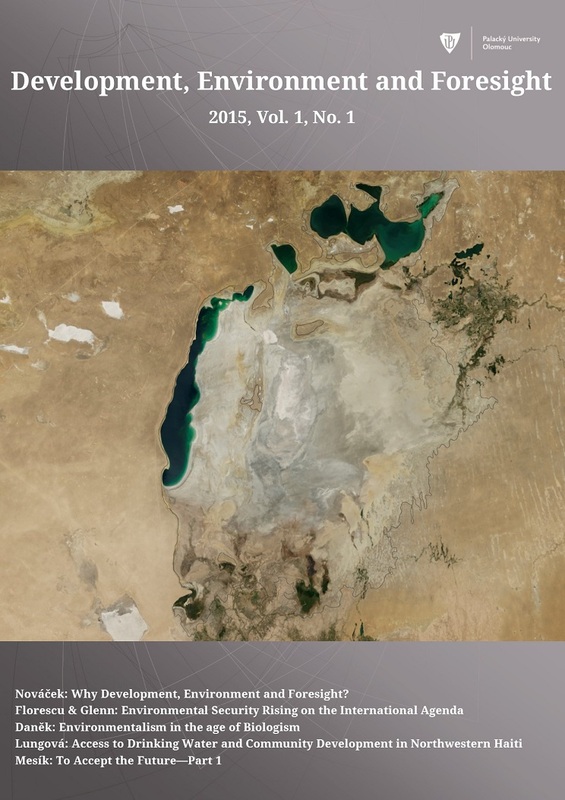 Dear colleagues, You now have the opportunity to read the sixth issue of the Development, Environment and Foresight journal, published by the Department of Development and Environmental Studies, Palacký University, Olomouc, Czech Republic. 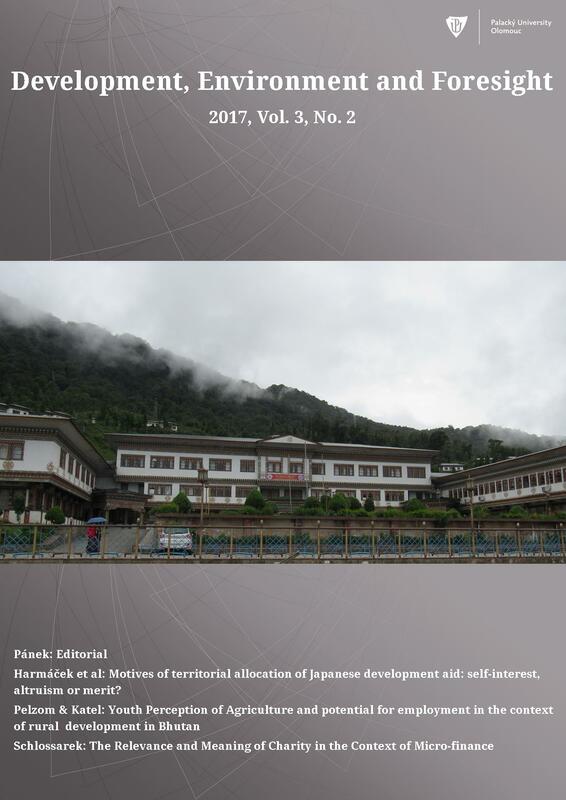 We are happy to present you the first issue of third year of the DEF Journal. 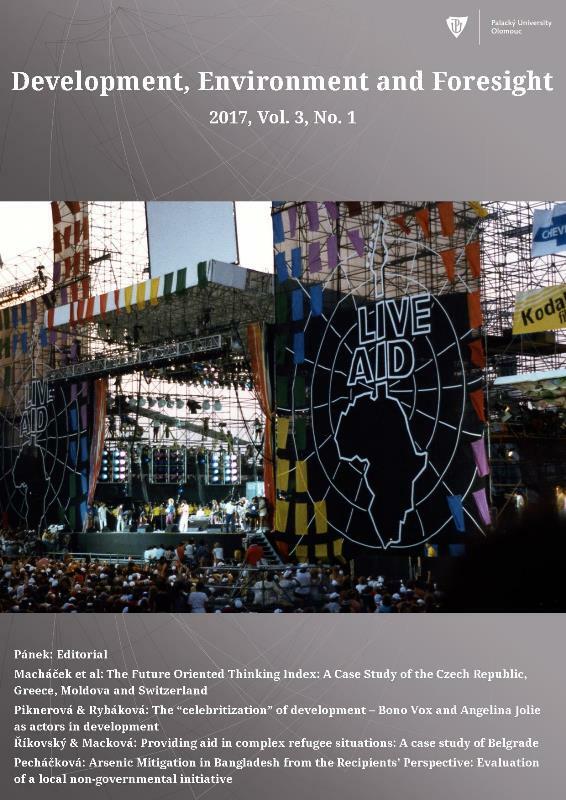 The first paper authored by Jan Macháček, Jiří Teichmann, Pavel Nováček and Pavel Kladivodescribes the Future Oriented Thinking Index via a Case Study of the Czech Republic, Greece, Moldova and Switzerland. The second paper presented by Linda Piknerová and Eva Rybáková focuses on the “celebritization” of development, subtitled Bono Vox and Angelina Jolie, actors in develop-ment. The third and fourth papers are written by students, Jan Říkovský and Lucie Macková, and Štěpánka Pecháčková respectively. Jan and Lucie report on the provision of aid in complex refugee situations via a case study of Belgrade. On the other hand Štěpánka describes arsenic contamination of groundwa-ter in Bangladesh as one of the largest examples of poisoning in the world, affecting mil-lions of people because groundwater is the main source of potable water in the country. 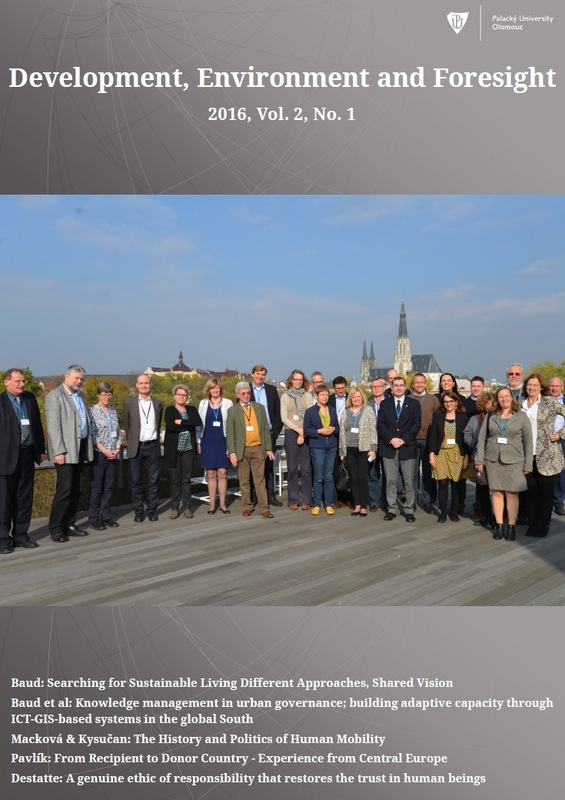 In the first issue of the second volume we have various papers from the „Searching for Sustainable Living – Different Approaches, Shared Vision" conference in Olomouc, Czech Republic.Starting with the Editorial “Searching for Sustainable Living Different Approaches, Shared Vision” from I.S.A. Baud, the president of EADI (European Association of Development Research and Training Institutes). 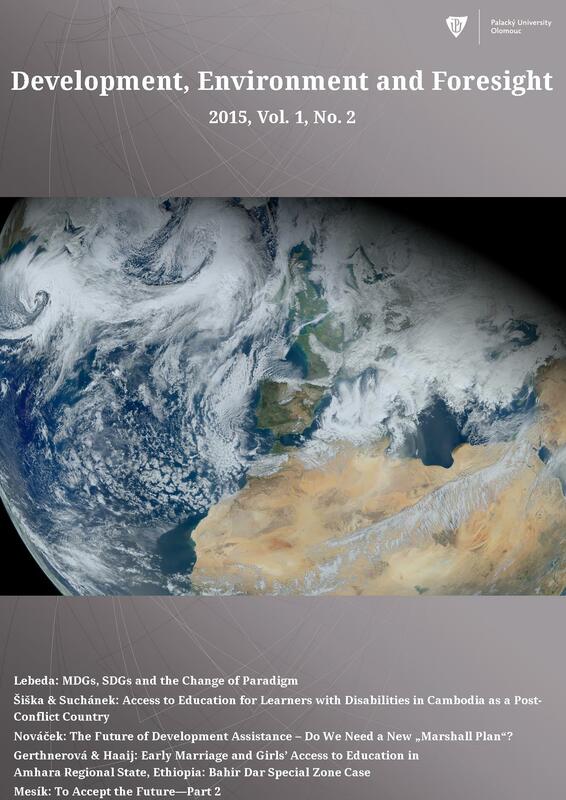 The editorial is followed by four Research Papers, titled "Knowledge management in urban governance; building adaptive capacity through ICT-GIS-based systems in the global South" from Baud et. al., "The History and Politics of Human Mobility" from Lucie Macková & Lubor Kysučan from the Palacký University Olomouc, "From Recipient to Donor Country - Experience from Central Europe" from Petr Pavlík, who works at the University of Economics Prague. The issue is closed with paper from Philippe Destatte "A genuine ethic of responsibility that restores the trust in human beings". 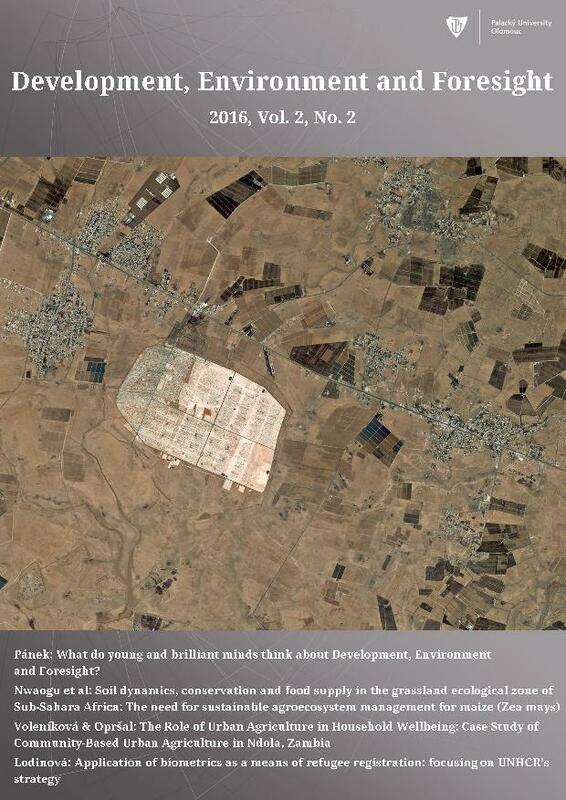 This is the first issue of Development, Environment and Foresight.